Tadhg Kelly over at What Games Are recently penned an article calling The Walking Dead a "Great Story" but a "Bad Game". By now you all know how fervently I adore Tell Tale's adaptation of The Walking Dead comic/television series. I believe it is the best piece of The Walking Dead franchise period. Naturally, I have some problems with Kelly's assessment. However, I have talked enough about The Walking Dead. Instead, I want to focus on this statement right here: "I want the experience to only be about the big choices, and for those choices to make sense. I want to feel as though there is a way to find the true course, and for every conversation to be important." I actually agree with Kelly on many points in his article and I do not mean to undermine all his arguments. He states at one point that "games are bad at storytelling, irrespective of the quality of their writing." I disagree, but I think his sentiments are based purely on personal opinion. Kelly, it seems, would prefer a nodal form of interaction with The Walking Dead, bypassing the mundane fetch quests and interrogative Q&A sessions to get right to the meaty decisions: who lives and who dies. For some, the big choices are the ones that matter, but we miss out on the minutiae of relationships and meaning in games if we so willingly set aside small scale decisions. Heavy Rain perfectly represents a game saturated with silly choices in between matters of life and death. 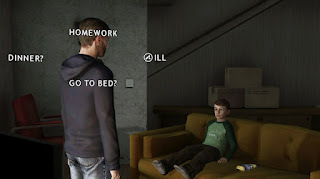 In a game ostensibly about a serial killer, a few moments stand out in particular: Sword fighting with Ethan's kids and letting his son win, trying to fix a shoddy dinner in a run-down apartment for his surviving son, and collecting the materials needed to chop off Ethan's finger. While cutting your own finger off is certainly a momentous moment, the most compelling aspects of that scene has more to do with the slow pace immediately preceding the decisive act. Finding a knife, disinfecting it, finding a bandage, all the pieces that went into the painful moment felt like a ritual. The slow pace heightened the tension and made the amputation so much more powerful. The "big choice" was never very hard. If it were my own loved one, of course I would chop off my own finger if it brought me closer to saving them. The small moments, however, emphasize the natural hesitation, fear, and doubt I would have in the process. In an idea adventure game, the small decisions provide a pillar upon which the big decisions take place. If I hadn't fumbled the simple task of pouring orange juice early in the game, the tension I felt at Heavy Rain's climax would have been far less powerful. The same can be said for the simple act of finding chalk in The Walking Dead. When I made the apparently mundane choice to talk to Duck and Clem before the adults, my decision altered the relationship I formed with the characters. I defined Lee's priorities. When these priorities are tested, when these established relationships become strained, these small choices reveal themselves to be the makings of big ones. They make up the small portions of a much larger system that could not be possible otherwise. Don't really have a lot to add here, but, absolutely correct... I'm sure there is a non heavy rain example, but I just can't quite think of it.